As the school year begins a nd we rush around, picture books are often overlooked. For a young child they can open the world, and for an older child they can quiet or explain a world that might be best explained visually. In this fast paced E-Reader world, remember the value of a picture book collection of your own and support authors who share their brilliant work with us. 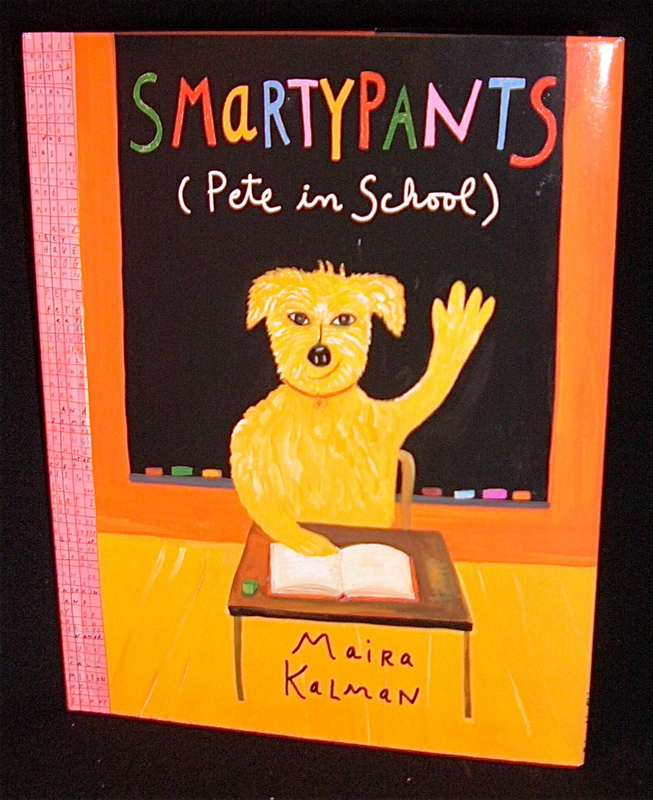 This book is by Maira Kalman, one of my all time favorite artists. She is absolutely brilliant. I laughed out loud just reading the back of this book. I hope you and your children will treasure Smartypants. Pete the dog eats everything! No kidding. After a long summer, Poppy Wise and her brother Mookie go back to school. Poor Pete is lonely at home without them, so naturally Pete heads to school. He interrupts every classroom eating everything along the way, including the 26-volume encyclopedia in the principal’s office. That night, Pete is able to speak. He is brilliant and filled with knowledge from eating everything at school. He tells the children fabulous facts and helps them with homework. The next day, Poppy Wise and Mookie disguise Pete and sneak him back into school. He gets to enjoy a typical school day, answering questions, being engaged and enthusiastic to learn. Unfortunately, by the evening Pete has digested all the information and is no longer able to speak; his knowledge is all gone and he is Sweet Pete the dog again. Thanks to a vivid imagination, a fabulous story and quirky wonderful illustrations, Smartypants is my winner for the start of the school year. Recommended for ages 5yrs to 100yrs. In honor of summer vacation, this is a “slow down” book that inspires outside play. We should never hear the word “bored” from our children. There are always BOOKS to read, things to make with sticks and boxes, or, as I say, laundry to fold. 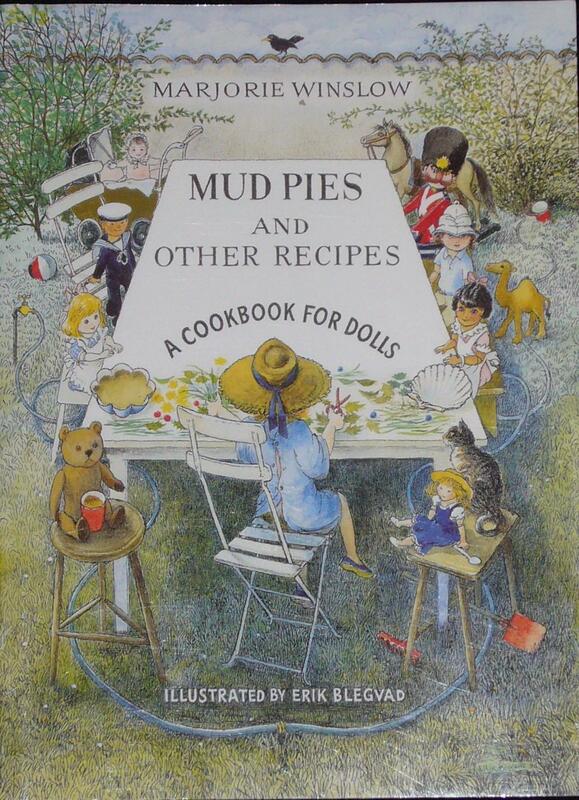 Originally published in 1961, Marjorie Winslow’s clever recipes are timeless. This little gem creates everything a doll (or bear) might like to eat during a good day of outside play. No need to purchase plastic play food, this book inspires children to make their own creations. I have fond memories of the beautiful plastic necklace “cakes” my daughter made for her dolls. I highly recommend this book; it reflects a kind of play that is mandatory but often neglected for electronic entertainment. It’s time to turn off the TV and go outside. I hav e the complete collection of My Naughty Little Sister books. If you can find them on eBay or Amazon get them! These stories are narrated as memories of an older sister’s about the mischievous behavior of her naughty little sister. I grew up on these stories and shared them with my children, who loved them as much as I did. Children love to hear about bad children, danger and the consequences of our behavior. The first line of the book is: “This is such a very terrible story about my naughty little sister that I hardly know how to tell it to you.” Each story continues to recollect the horrible actions of this child, but the language is wonderfully lyrical and fun to read out loud. Written in 1939 for his daughter, this is a very feminist tale. In a world where there are 5 Easter Bunnies a little girl rabbit says “Some day I shall grow up to be an Easter Bunny – you wait and see!” But soon she has 21 babies. She teaches them life skills and teamwork, so when it’s time to pick a new Easter Bunny she goes out for the job. She proves that her children are self sufficient and will be fine for one night without her. This is a story every girl should have. It has an important message that you can do it all…… just not all at the same time. Margret and H.A. Rey escaped Nazi Germany on their bicycles and in their belongings was the first draft of Curious George. Then, in 1945, Spotty was written. Often only available around Easter, this book is not about Easter bunnies but the intolerance of difference that exists in our world. Spotty is a spotted rabbit born into a white rabbit family. Because he is different he is left out home while his family goes to Grandpa’s Birthday party. Grandpa would not approve of a spotted rabbit. Sad and alone Spotty runs away. In the woods he meets a spotted rabbit who brings him home to his spotted family. There in the corner is an all white rabbit. Like Spotty She did not fit into her family. He explains how his family is all white and he is the different one. The families meet and the story ends with a message of tolerance and acceptance. This is a sweet slice of life story. Every Friday a father and son spend the morning together. They slowly walk down the street taking in everything around them until they reach the local diner. They eat pancakes, talk about anything and watch people walk by. Such a simple tradition can lead to a life rich with memories and a special bond between parent and child. This book makes you want to give the gift of time and ritual to the ones you love. This is a fabulous story of a curious child whose constant experimentation gets her in trouble. She is obsessed with beavers and taunting her little brother. Her imagination is both naughty and brilliant. The adult expressions of frustration are priceless and the simple text is hilarious. Recommended for ages 7 – 90 yrs, because adults will enjoy this picture book as much as children.